Well, look at the bright side, you've got more time before you're killed by African warlords. I've had a challenging few months, and I'm more than overdue to give you all an update. I feel extremely lucky to be supported by new friends and family, without their support I don't think I would have found a way forward. 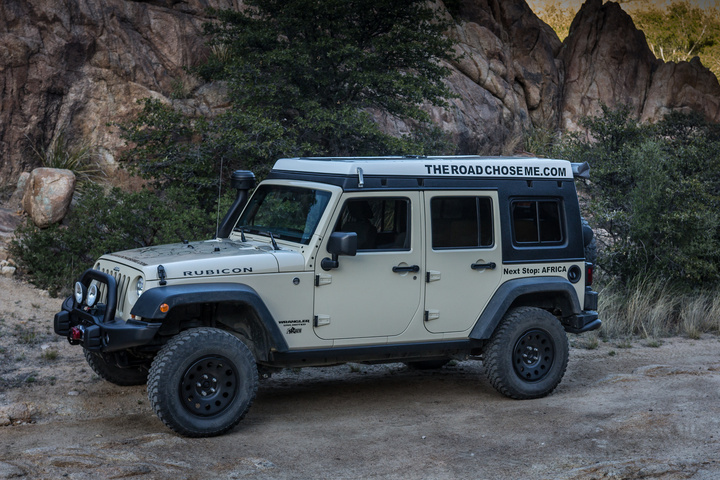 Phase two of the Africa Jeep build is now complete. Onwards to the final piece, EJS, then Africa. I spent a few days in San Diego hanging out with John and the crew at Ursa Minor while the fitted and modified my J30. To say that I'm extremely impressed and happy is a massive understatement. This top is a complete game changer. The Jeep Build is complete, I'm ready for EJS then Africa. 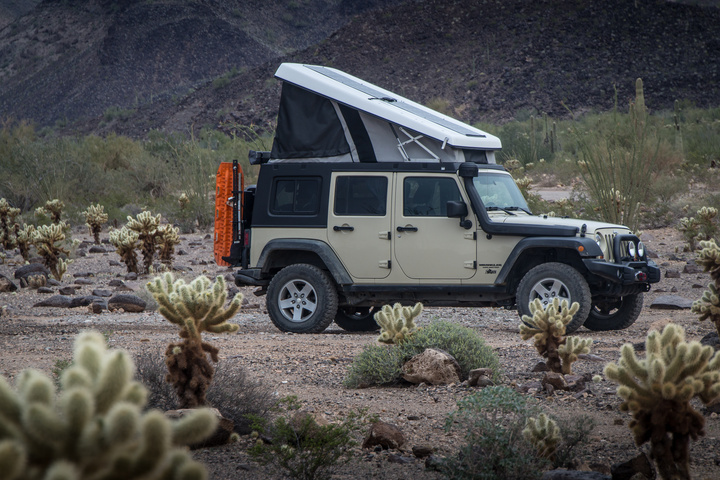 Details include Renogy lightweight solar panels and charge conroller, ARB awning & compressor, new wheels, and some decals. Looking good! Reading up on your progress and am impressed with the effort sir. I ran part of Hells Revenge yesterday, it was unreal. I went into the Escalator, did trail work with great people from Tread Lightly then turned around and came back out. I was told my Jeep would have gone right through, doing all the drive arounds obviously. 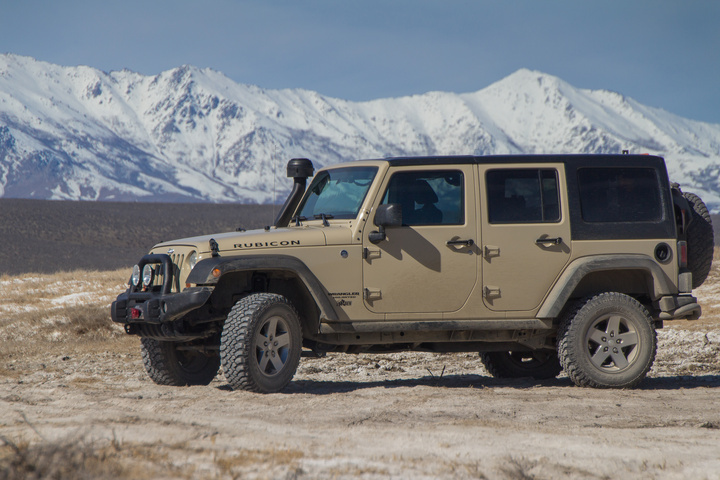 AEV 2.5", stock Rubicon 32" tires, jeep didn't scrape once. I'm extremely happy to have gotten the Rubicon now, the crawl speed of low range 1st gear is impressive. Dan, happy to hear you're moving forward again. Best of luck to you, the Jeep, and Sid! 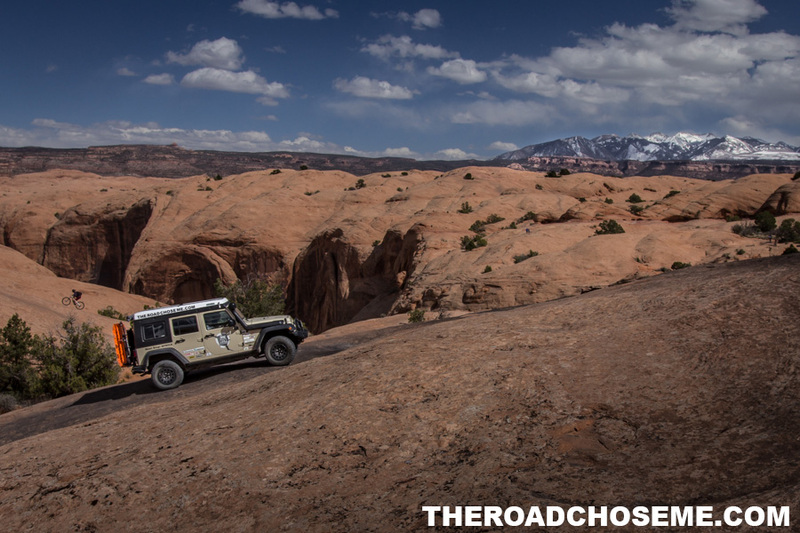 I had an awesome time at EJS in Moab, it really is a Jeep addicts dream. I'm in Michigan now, getting closer to the coast to ship the Jeep over the Atlantic. 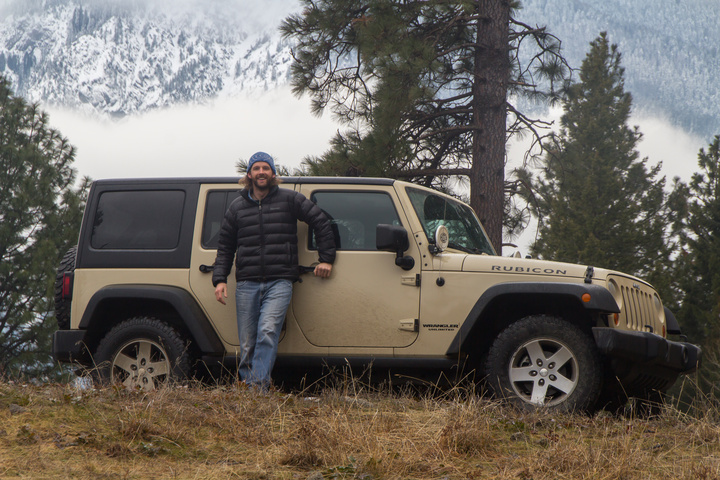 Living in the Jeep for a few weeks has promoted me to make all kinds of minor tweaks and adjustments for living convenience. 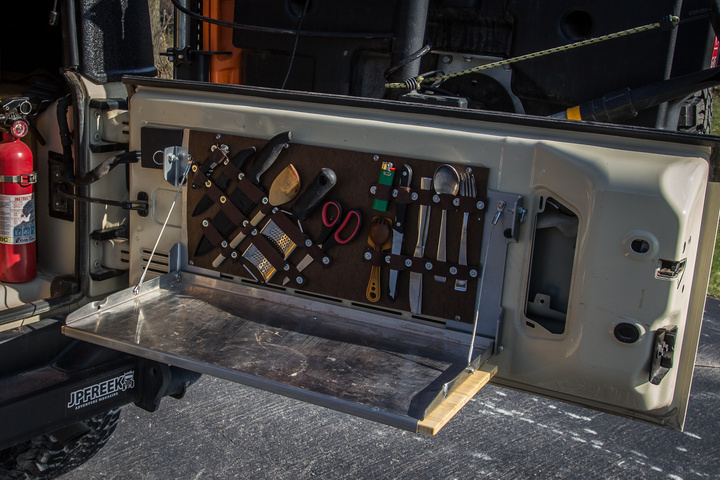 Space has always been at a premium, so I made a cutlery/tool holder on my Trailgator Tailgate Table, so I can leave often-used items there when the table is closed. Let me know if you would like me to write up a HOW-TO article so you can make your own. I spent a lot of time thinking about and researching wheel and tire choice for the trip. I've written up a piece explaining all my thinking, and what I'm running. 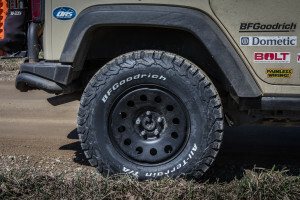 Those tires are long lasting and quiet on the road but are crap in mud and have little grip in rocks. Thanks. It was for sure an option I considered. I spent a long time looking at the Goodyears. The reviews I read said they are much closer to a mud terrain - noisy, hard to balance and fairly soft wearing. I need to get an absolute minimum of 50k miles out of one set. Good luck. 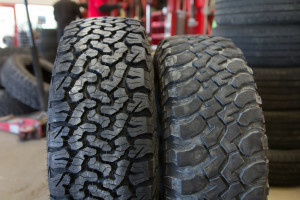 The first time you hit a mud hole with those a/t the tread will clog up and they will spin like a ball bearing.